As our Sub Group returns from its October ‘16 visit to Thailand, we are pleased to report good progress. Following the Task Force’s initial vessel trial activity with the Satellite Applications Catapult, we are now working in two distinct areas. The monitoring of Thai flagged vessels (Gulf of Thailand and the Andaman Sea) and Port State Measures for all vessel Imports. In our work with Thai flagged Vessels we have been encouraged by the Department of Fisheries (DoF) recent initiative to move from a VMS centre to a full Fisheries Management Centre. Over time, they will absorb the Command Centre for Combatting Illegal Fishing (CCCIF) into an enlarged organisation to cater for this broader scope. The DoF has already recruited an additional 82 staff working as vessel behaviour analysts in readiness. Currently they are responsible for the information flow to the Port in / Port out (PIPO) offices and to ensure that the following key areas are managed – That all licenced vessels have their VMS system switched on at all times. That vessels do not go into restricted areas. That vessels do not violate the Thailand EEZ. And that the behaviour of 200 vessels is assessed in real time. The strengthened DoF team is really motivated to deliver progress and the co-operation and honesty we received was truly refreshing. There is however still too much information for the existing people resource to handle, especially if they try to add the 10 to 29 Tonne vessels at this point in time – These are conservatively estimated at 5,000-8,000 boats. For the 30 Tonne and above vessels, current Task Force support work will be reviewed and presented to the Director General. With the expansion of their present setup towards a Fisheries Management Centre, the offer can be more targeted against abuse. It is essential that the Centre allows the DOF to Prosecute offenders through the courts. With regard to the 10 -29 Tonne vessels, tracking systems are currently being scoped but in reality, will be currently limited in application by issues with capacity. The goal for the Task Force is to continue our work with the DoF to drive sustainability from a base of Science, Accountability, Compliance and Industry Engagement. 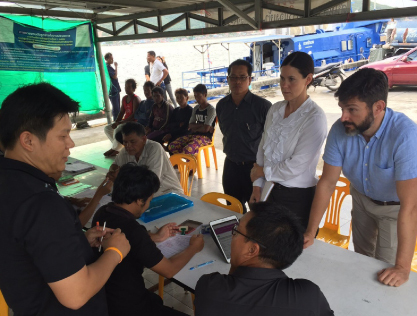 In our work with Port State Measures for Foreign-Flagged Vessels (including carriers), the Sub Group team also visited the International port of Songkhla where we witnessed good basic systems in place that now need to be updated and improved. Again, we were met with a real commitment to understand the requirements of Port State Measures and a desire to improve for everyone using it in the quest to eliminate IUU. Improvements will focus on Standard Operating Procedures to remove gaps both in interpretation and lack of understanding regarding coastal state compliance. The Task Force will be seeking external funding to support Port State Measures programme and is hopeful that funding will be secured. We continue to seek an approach that will give Industry Compliance Insight alongside Government action that will serve as a model to eliminate IUU. This must work in conjunction with the Task Force / UL Audit Program that has been developed such that Government may well question entry of a consignment. Industry can then adopt a more inclusive view.